Today we have brought you good quick summary of accounting standard 7 or AS 7 in short, This indian Accounting Standard 7 is mandatory as of July 1 2017. Construction Contract :- A Construction contract is a contract specifically negotiated for the construction of an asset or a combination of assets that are closely interrelated or interdependent in terms of their design, technology and function or their ultimate purpose or use. When the outcome of a construction contract can be estimated reliably, contract revenue and contract cost should be recognized as revenue and expenses by reference to the stage of construction. Contract costs should be recognized as an expense in the period in which they are incurred. The contract costs attributable to the contract can be clearly identified. They are capable of being reliably measured. Costs that are attributable to contract activity in general and can be allocated to the contract. The proportion that contract costs incurred for work performed upto the reporting date bear to the estimated total contract costs. The costs and revenues of each asset can be identified. The contracts are performed concurrently or in a continuous sequence. 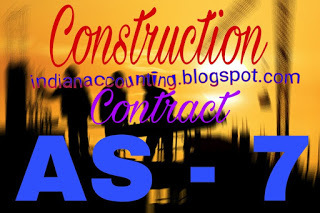 The recognition of revenue and expenses in construction contract is based on reliable estimate. This estimate may vary from one accounting year to another accounting year. The effect of change in estimate should be treated as per AS-5. i.e. It should not be treated as prior period item or extraordinary item.